This is a guest post from Mrs. Micah of Finance and Life. Look for a related post later today. Getting an interest-only mortgage can seem like a great idea when you're trying to buy a house and can't afford a down payment (or if you have bad credit). Earlier this week, I read the story of a couple who are celebrating home-ownership under just such a situation. But while they're happy, odds are that this is actually a disaster waiting to happen. Reason #1: You're a house flipper. No down payment, lower monthly payments for ten years — since you're flipping, you probably plan to have the house for less than a year. Why bother paying more? Using interest-only means that you can direct more capital into fixing up the place. And since your goal is to increase the value of the house, you probably won't have to sell it for less than the mortgage. Congrats. You have an excellent reason to take out an interest-only mortgage. Reason #2: You plan the stay in the home for all 30 years. In the end, you'll spend the same amount of money with an interest-only or a normal mortgage. If you plan to stay in the home, have a well-paying and steady job (perhaps you work for the government and the bureaucracy make you impossible to fire), and want to invest the money you'll save in the beginning to take advantage of compounding, then get the mortgage if you absolutely must. Imagine you have a $100,000, 30-year mortgage at 6.25% with the first ten years as interest-only. (The calculators listed at the end of this article can help you run the numbers for different values and rates.) While the money you pay for those first ten years — $62,500 — will have value if you stay there for the full thirty years, it will be little or no better than renting if you move earlier. Actually, it could be much worse than renting. If you need to sell before the interest-only period is over, you'll still owe the full value of the mortgage ($100,000 in our example). If you can sell it for more, you come out ahead. But if you sell it for less, you'll still owe the difference. In today's housing market, that's particularly worrying, since the odds are high that your property value will decrease. On the other hand, by going fully-amortized during those first ten years, you could build $15,223.87 in equity. That's more than you'll save by paying interest-only. Under an interest-only plan, it's only around the 25-year mark that the equities equalize. Until then, you'd be ahead with the normal mortgage. In this example, having an interest-only mortgage saves you $94.89/month at the beginning. That's $11,386 in payments over the first 10 years. However, after the 10 years, your payments go up by $210/month. Now you're paying over $100 more than the amortized rate and you have to find that extra money in your budget. This might make financial sense, say, if you were in a secure job or field where you could be sure that you'd have the extra money within 10 years. But what if you lost your job (see #1 about having no equity)? Or what if you had more children and expenses? In the world of finance there are few guarantees — except that if you can't pay the new rate and can't refinance, you'll be in trouble. Looks like a bad deal, doesn't it? Before you say an interest-only mortgage fits you, think long and hard. Consider the reasons it's a bad idea for most people. If you're the one in a million who actually could pull it off, then go in with eyes wide open. And best of luck to you! Otherwise, I suggest that you avoid these like the plague. Are they better than adjustable-rate mortgages (ARMs)? I don't know. Possibly, since you should know ahead of time what you owe and what the interest rate will be. But it's like comparing arsenic and cyanide. You're best off not taking either. There are 48 reader responses to "The Pros and Cons of an Interest-Only Mortgage". What if you CAN afford a regular 30 year mortgage and you pay above your interest only payment? In effect you are only required to pay the interest only payment but can afford to pay more than that. So you get into a house without a down payment and avoid PMI and pay your extra principal payment monthly. If you look at the amortization table the early years are pretty much interest only anyway! I don’t understand, couldn’t you get an interest only loan yet still make principle payments quarterly or yearly? If you are disciplined then interest only can be a good tool. The problem is most people are not disciplined int their finances. So you eventually see the bill and rationalize that it is o.k. to just pay the minimum. If I’m buying so much house that it stretches my budget so that I can’t afford to pay $98 in principal from day 1… then I need to look at a less expensive home! Other than investors who turn houses quickly, there is really not much sense in interest only. It just provides yet another way for people to buy more house than they can really afford. With that, I’ll say the only real reason to use an interest-only mortgage is to increase cash flow for whatever purpose the borrower may have at the time. In other words, the borrower has an opportunity to use the “freed” cash in such a way that can provide a greater “return” on that money than paying the mortgage. Personally, I used an interest-only mortgage refinance to pull cash out of my home equity to start my own business. The lower interest-only payments allowed me to use the extra cash to get my business off the ground, which is now yielding three-times the “return” I would have received by paying down principle on a conventional mortgage. Interest only mortgages helped fuel the current sub-prime disaster. I agree with Curtis, if you can’t afford the princial from day one, you probably need to look for less house. Few people are disciplined enough to make this a wise investment strategy. Anyone getting an interest only mortgage thinking that appreciation will set them free has another thing coming this year – I just heard on the news this morning that (nationally) home values are down 4.2% from this time last year. Different types of mortgages for different types of financial situations. We have an Interest-Only (low) fixed rate mortgage and with discipline, you can pay an amount towards your mortgage principle at the start of your mortgage. In our case, we currently pay the exact mortgage amount that we have to pay after the 10 year no-interest period is over. If something unfortunate happens in our financial situation, we can reduce or eliminate principle payment till the situation gets better. No stress of thinking: I have to sell my house because I can’t afford it. If the situation stays as is, the mortgage is paid of in 20 years. Again, it depends on your financial situation and most importantly financial discipline is key! Wow. 6 posts (when I posted this) and only one person mentions the sub-prime problem that’s happening. It’s surprising that the author didn’t mention that it’s going to be almost impossible to qualify for these types of loans from now on due to the escalation credit crunch. I’m of the mind set that if you can’t qualify for a 30-year fixed, don’t bother. Save some money and rent. Great post, very clear and straightforward breakdown. I agree with some comments that you could use an interest-only loan wisely, but my perception is that most people who took interest only loans did so in order to buy a house that they probably couldn’t really afford in the first place. That being said, I think it is still far better than an ARM. You just open yourself up for all kinds of risk if you go the ARM route. Interest only mortgages can be excellent financial tools for the right circumstance. Your home equity is not “earning” any interest, it’s stagnant. If one invested the difference into an interest bearing account, they would probably be financially better off. In your scenario of someone losing their their job; at that point, they would not have access to their equity (unless they have an untapped HELOC) since they would not qualify unemployed. In this case, they would again be better off in the scenario I described where they would have the funds earning interest to rely on if needed. I’m not saying that i/o mortgages are for everyone…in fact, mortgages are not for everyone as we’re are witnessing in the current “mortgage meltdown”. This is a very interesting post and I plan to respond on my blog. Thanks! Fixed period interest only mortgages are not what has fueled the mortgage melt down. They are not subprime mortgages…in fact many are Fannie/Freddie. -stated income (especially when the borrower was not self employed). -option arms (this is different than fixed period interest only). -subprime 80/20 allowing dti’s of 55% (full doc). I’m a new reader to this blog…so forgive me if this has all ready been addressed: the big culpret is Wall Street and the rating system which did not disclose the risk of these types of mortgages. I don’t have a problem with interest-only mortgages if you’re using them to your advantage. They’re a great option if you’re purchasing a rental property because you’re able to maximize your cash flow. I wouldn’t use one for my own place though. Like was said before, if you can’t afford a little extra principal payment, you probably should look for a different home. Besides the issue of how interest only have fueled the sub-prime crisis and caused people to buy more than they can truly afford (and inflated home prices above what they should be) isn’t it true that most interest only’s are also ARMs? I never looked into it deeply when I purchased because I knew from day one I wanted a 30-year fixed, but I was under the impression that most interest only’s were ARMs. An interest-only mortgage increases the risk that you’ll have to bring cash to the closing. It has nothing to do with whether the value of your home itself decreases. If you buy a home for $100,000 and sell it for $95,000, you have lost money whether you have equity in the property or not! If you use an I/O judiciously, putting the money that would otherwise go to principal into savings, you can withdraw that money in the event you lose money on a sale and have to bring cash to escrow. I think this is a good general overview of the basics. But sub prime issues will continue to make it very difficult for many to qualify for and obtain mortgages nowadays. A lot can be said for renting right now..
1. IO loans are fixed rate. I’d bet 95% are ARM loans. 2. You purchase a house and put no money down. 3. The IO in not a refi where the homeowner has mucho equity. 4. Makes no mention of people with variable income who during lean months benefit from lower IO payments. I have an IO loan; when I took it out I ran an amortization schedule for a fixed rate loan of the same size & interest rate and I make those payments. If the budget is tight on any given month, I just make the interest payment. 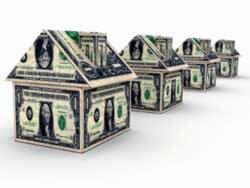 When I refinanced, I had $150,000 of ‘equity’ in my house. Since I plan on living there 10-15 more years, the ‘equity’ I build up is irrelevant (since you can’t use it unless you sell or take out a loan). I guess I’ll have to live with my cyanide. A year or so ago, my wife and I were doing some planning and realized that due to her health, my mother-in-law would probably have to sell her house and move in with us. She had always said that when that happens, she will give us the proceeds from the sale of the house. That got me thinking – maybe I had found a case for an interest only loan. My wife and I would buy one of the first houses that were built in a subdivision and finance it with an interest only loan using the equity that we had by selling our house as a down payment. When my mother-in-law actually sold her house and moved in with us, we would refinance the house with a conventional fixed mortgage using the proceeds from her house to further reduce the principal. I know that there is always risk involved in one of these types of loans, but that scenario sounded pretty good at the time. We have yet to do it, but at least I know that it is an option in the future. I agree with most of the comments about being disciplined in using an IO–making extra payments on the principle and such. A person who’s very aware of their personal financial situation might be able to pull that off (whether you’re a financial professional or a regular GRS reader). While I’m not particularly a Dave Ramsey follower, I agree with him that the odds are people will find other ways to spend the money. IOs can be good tools in certain circumstances or decent tools and aren’t evil in themselves. But they make it possible for people to get themselves into an awkward financial state (and it’s easier, I believe, than with a traditional mortgage). Anne: It’s true that you’ll lose the money anyway. What I mean, however, is that if it sells at $95k but you put $15,000 into the home, you don’t have to come up with the $5000 out of pocket. You only owe the bank $85k (and other costs associated with the sale). Whereas if you went the IO route, you have to come up with the $5000 or take out another loan. Jack: You can get an IO without an ARM, but there are also IO ARMs just to make things fun. Rhonda: I look forward to your response. The idea of investing the extra money is an interesting one. “…by going fully-amortized during those first ten years, you could build $15,223.87 in equity. That’s more than you’ll save by paying interest-only.” When I read this I was wondering at what interest rate? A 0% interest rate assumption (which is how the comparison is shown) means that person spent the money rather than saving it. Everyone should run the numbers for their own situation. Besides if you loose your job during the next 10 years and need to access your equity, it is a lot easier to write yourself a check from your savings account than to qualify for a new cash out loan with no job. Liquidity should be counted as a positive. It is with other financial instruments. Most people are lousy savers and will use the extra money to inflate their lifestyle because they lack a good plan and discipline. That means the fault is with the people buying and selling it, not with the product itself. When my wife and I purchased our home several years ago, we went through this consideration. One factor that is left out is this. We had very little down payment (10k), and felt that buying a home was in our best interest. Our loan options were getting a 80/15 or a 95% loan with PMI. We opted for the 80/15. The rate on the IO wasn’t that much higher than the standard (at that time, maybe 1/8th). We then took the principal that we would have been paying on the 1st and paid it to the second (which has a much higher rate). This way we save money by paying off the second in 6-7 years (instead of 15), and still put the same principal aside. You have to run the numbers, but this tipped the balance for us. It’s a numbers game. For most people I/O loans won’t work because they won’t save the principal. It also doesn’t matter if you pay down the house or saved the difference if the value of the home dropped from $100k to $95k. Either way you lost money. Arms are not bad. They also have their place in the financial playbook of life. I have an Arm. I am saving about $60k by getting an Arm. It will take me about 5 years after my 7 year fixed period to make up the difference of interest savings the first 7 years. And that is at the highest rate. So basically I have to live in my house 12 years before a fixed rate would have been worth it. Will I live there? No, guarantee I will not live in my house 12 years. But it’s individual circumstances. Not everyone can say that. Also whether you buy a house with I/O, Arm, or fixed rate mortgage, if you lose your job the only thing that stands between you and foreclosure is an Emergency Fund/Taxable accounts. You have to live somewhere and you have to pay rent or mortgage. So those people in trouble with subprime. Have a lot more problems than just a large mortgage that is going up probably. They probably live paycheck to paycheck. They probably have little savings. As a recent (two weeks ago) homebuyer, I’m going to throw my two cents in. When I originally spoke to my mortgage lender a few months ago, it turns out I didn’t qualify for a 30-year fixed, but it wasn’t the typical situation. I have an excellent credit score and a decently high, stable income. The problem is that I owe about $100K in law school loans, and the market is cracking down so much that I just tipped over the income/debt ratio to qualify for a fixed. It wasn’t that I couldn’t afford the fixed rate payment, and I knew that if I got an IO I would make sure there were no prepayment penalties and just make the corresponding fixed payment, and I also knew my credit was good enough to refinance if I kept the property for 5 years. Some might say that I should have waited and thrown everything to get my school loans down, but they’re sitting there at 4% interest and, frankly, helping my credit by just existing, so I don’t see the need to pay them off as fast as possible and put off buying a house for another five years (esp. during such a buyer’s market, and even more esp., when this house could actually pay off my loans in one lump sum if I sell in 5 years). Another thing that convinced me an IO would work for me was when one of the financial guys at my office, who makes a hell of a lot more than me and has a two-income household, told me he got an IO. He took the money he would have put towards a downpayment and invested it instead, for much higher returns over that 5 years than the equity would have provided. Of course, as people have said above, you actually have to invest it and not spend it. In response to Jeff’s original comment, rather than paying an additional amount on your mortgage (toward principle) you would be better off investing in your 401k or pretax retirement accounts. Why not reap the benefits of compounded interest. We have a fixed IO loan ad here is why: We are involved in a seasonal business, in particular, farming. Our business income can be very irregular. When it comes (I emphasize *when* because we’re bracing for a very bad 2008), it is in a lump sum in March or November. I chose the IO because we can make the monthly payments on our salaries. Then, when our farming income comes in, I allocate that to several accounts: next year’s vacation, home maintenece and improvement fund, retirement and education savings (above the monthly amounts) and mortgage principal. Surprising that this article is even on this website. Her presentation is ridiculous. Does anyone really know anyone that has succeeded with these types of loans over the course of 10/20/30 years. If your last paragraph contains the sentence, “If you’re the one in a million who actually could pull it off, then go in with eyes wide open. And best of luck to you!” then you should not be in the financial advice game. Too many people giving advice. Hey I have great health advice its called Russian Roulette, take a six shooter, load five bullets and hope that you get the empty chamber. If you do, you will be living life to the fullest. A couple of you touched on the true matter. Financial success is bahavior not number crunching, people dont save enough, myself included. My behaviors toward finances were not great, As I am change them, I am feeling and doing MUCH better. No ‘special” deal or rate or new loan was getting me out of my mess. It was an attitude adjustment. The risks are too high for this path to be considered. This article leads people to believe that it “might” be possible. Bad Advice. Your opinion was not very humble. Anyways, the IO loan can work well. If I was presented with an IO fixed rate loan and a standard P & I loan with the same rates, I would take the IO loan. I already pay more than needed on my current mortgage and would do so with an IO loan, but it would be nice to have the flexibility of temporarily having lower payments if needed IMHO. Honestly, and I hate to say this, but I am one of those who got a mortgage without knowing really what I was doing. I have an interest only mortgage now but I pay an extra $200 a month and put that I want it to be added to the principle. I also have an ARM (one mortgage only–no heloc) and the rate is currently 4.75 (for 5 years) but will reset in 2 years. I saw online that the arm span (?) is 2.75 percent. Someone told me that when my low rate expires in 2009, each year after that my interest rate will jump 2.75%, so in 2010 it will be 7.5% and then in 2011 it will be 10.25%, etc . . . I told him I didn’t think that was right but I’m not sure. Anyone else confused by their ARM too??? A few things. I work in a bank in the secondary marketing mortgage department so I see these things on a daily basis. IO loans are also “safe” if you plan to refinance after the IO period ends assuming that your house has appreciated. Even with a horrible housing market, it’s hard to believe that your house wouldnt apperciated 10 years from now. Either way, def a risk you are taking. This is actually not accurate. There are just as many IO conforming prime loans being done today as before the problems…The only diference now is that you have to have a decent FICO score..the people who mostly did subprime loans had really crappy FICO scores…say 550-600. They are the ones who will have a hard time getting IO loans today – as they should. And one positive. Effective Nov 20th, to be able to qualify for a IO loan from Countrywide you must be underwritten using a fully amortizing payment..which means you HAVE to be able to afford the after-IO payment to be able to get the IO in the first place. The 2.75 is the margin and tells you by how much your rate will go up from the index when it first adjusts. Your index is either the Libor or TBill. Your docs will say. The tbill today is about 3.9, so 3.9+2.75 = 6.65 would be your rate if the index were still 3.9 when your rate adjusts. The 2nd peice is the caps. Most likely you have a 5/2/5 or a 2/2/6. This tells you by how much your rate can go up on the each adjustments and also tells you MAX rate you will go up to. But just as you thought, your loan will NOT NOT NOT go up by 2.75 each time after the 1st year. Klauss your right it was not very humble. But why mess with all this junk. I would hate to think of my mortgage adjusting and having to pay more or paying every month and knowing that it is not going down. I had a I/O heloc and it pained me to see that thing never move. So I changed it to a fixed rate. Siena I would do the same. Your mortgage will be fixed and that is comforting. It is hard to hear but if you cant afford the fixed rate maybe you can not afford the house. I guess after maybe this article was a good conversation starter. I still didn’t like it but hey if it gets people talking then that is good. I’m highly amused that Jack picked up on my last sentence while Ernesto picked up on the cyanide part. ;) Some see only the the (apparently objectionable) pros, some see only the (apparently objectionable) cons. Apparently, Jack, people are pulling off IOs if you read the comments. I’m sorry you don’t like my writing style and didn’t pick up on the wryness in the last sentence (as in, “Good luck–you’ll need it!” Everyone else did and got offended ;) ). Ernesto, you’re in one of the situations where having an IO is probably not a huge mistake, as I said in the piece (you’ve been in the home, you plan to live there for a while, etc). I realize now that perhaps I should have included refinancing as well–but the piece that I was addressing was about first-time buyers so I stuck with that. If nothing else, it’s raised some good discussion. Mrs Micah I am surprised that you ended the article like that, especially if this was for First time home buyers. Joking or not. And are they really “pulling it off” and if they are then for how long will they be able to “pull it off”, and still get ahead. If this article WAS intended for first time home buyers then it was even worse advice, because if they have to get into some crazy loan, like an ARM or and I/O just to get in the market then maybe they can not afford to be in the market. I really think that some of these people are rare, like Klauss, who has an I/O and then pays off more each month. That takes discipline. People tend to pay off the minimum. I hope that I did not offend you, that was not my intention and it was not your “style” that I disliked. You kept me engaged the whole time you just didn’t take a stand. I want to hear YOUR opinion. Your article was far to bi-partisan. “oh you can do this or oh you can do that”. The pros and cons seemed wishy washy. I never got a sense of what YOU feel. I too have an IO mortgage. I could have qualified for the fully amortized payment but I chose to use the difference to payoff my debt. I have had this mortgage for a yr and a half and I have paid $200 minimum in principal every month. I plan to refi or sell in a yr or two depending on how the market is going at that time. Thanks Ian, for the info. I will look into my paperwork (or maybe it’s on my online account)–I don’t know what kind of mortgage I have other than it’s an ARM. Jack, I honestly don’t know if I can afford my home after the increase. If the increase is around $500 a month I can afford that without being too stressed out. If it’s $1000 a month, I’d be screwed. And this is now when my car is paid off (woo hoo!) so I don’t have a car payment. When my loan resets I will look into refinancing and see what my options are but honestly I don’t want to lose my current low apr which expires late 2009. I’m hoping by then the mortgage industry improves. Siena, please dig out your note and follow the advice from Ian in comment 30. It’s crucial that you (and everyone) with an adjustable rate mortgage understand how and when it will adjust and what the “worse case scenario” will be. Bankrate did an article earlier this year (I believe) that a majority of Americans have no idea what the terms of their mortgage are. You are not alone. I’ll go out on a limb here and say that interest only loans are stupid. Sorry if you take offense at that. Maybe I’m wrong, but no matter how you sugar coat IO loans (pros in the post, reasons given by people above), never applying any money to repay a loan is just plain irresponsible, lazy and sloppy. Not to mention that if you even need an interest only loan you clearly can’t afford whatever it is you’re buying with it. Of course, that goes without saying for anything you buy. If you can’t pay for it, you’re not ready to buy it. Don’t be surprised if you find yourself in a mess because you took out some stupid loan for something you couldn’t afford because you got house fever. I think the interest only mortgage makes sense in the beginning of the purchase so that cashflow is a little easier at first. After 2 years or so it’s better to swop to full payment after rental / cashflow has increased and you can therefore afford the extra cost. Can anyone explain in layman terms what an IO mortgage means? I am not a financial guru but…..I do believe that there are people jumping into the housing market that really can’t afford it. (like me 15 years ago….I am more educated now !) Many people have it in their mind that they HAVE to own a home and they don’t really take everything into consideration. And the nice thing, Eric, is that the borrower can pay additional principal on their own; they don’t have to incur the cost of a refinance when they decide to make a “full” payment vs i/o. I am biased towards fixed period i/o mortgages because of the flexibility they afford consumers. With that said, not all mortgages are right for everyone. Interest only are not bad loans. You have to understand them to use them effectively. A traditional 30 year fixed mortgage repays very little principal in the first few years anyway so an IO can free up cash flow. If you use the cash flow for productive means such as reducing other debt or investing, then it is a wise move. If you use the free cash flow to buy consumer goods, then the traditional mortgage might be a better path (a forced savings). It comes down to your level of knowledge and comfort. Generalized statements such as IO loans are bad don’t work for this issue (or most issues for that matter). Like the piece or not, you got people talking, and that is good. Well done. I agree with jtimberman I/O are stupid. Like 0% credit cards and car leases. They seem like bait and switches. Can you beat them, yes, but in Vegas, you can win at roulette but your better off at craps. Odds are better. I hope everybody makes it. I want people to be in their homes happy and working, I hate seeing people struggle. Myself included. Another argument most people forget is they are writing from an AMERICAN perspective. In other countries a fixed rate loan is UNHEARD of. In Canada, UK, Australia they only do Arms. And people there aren’t in the same bind. Why? Because they view it differently. They don’t overbuy homes. They don’t put 0% down. Lending requirements are stricter. That is one thing about it. First of all, congratulations on your new house! And I think it’s great that you are able to refinance quickly and have equity already. Sadly, many, many people thought they could refinance before their ARM I/O was due to reset. But, the market went down and BOOM! now they owe more than their home is worth. And can’t refinance. Thousands of homeowners across the US are in that situation (look at San Diego, Las Vegas and Phoenix for some examples). Their only choice? Make the higher payments, sell the house as a short sale, or foreclose. It’s a risk you take, and some people are better able to handle all that comes with risk (like failing) than others. I have an I/O. I bought before I’d completed the closing on a Manhattan condo. The new place was worth less than the old and the equity from the place I was selling was over 500k. So the I/O enabled me to close on my new place while closing out the sale on my old place. And I had the cash to carry me in case the closing was delayed. When my old place closed three months later, I paid off the majority of the I/O. I still have the I/O which now has much lower payments and it suits me fine. Once I get through the preschool and nanny years with my two kids, I’ll start paying additional towards the principal. I/Os have their places. And I also work in the financial industry so I knew the risk I was taking was controlled. That said, I’d never suggest my brother who isn’t as financially stable take on an I/O unless it was for a term less than a year. I do not want to put my equity in my home. I’d rather pay for this convenience by the hedging costs on interest rate volatility (so fees option contract = hedging costs) and can adjust those for my own personal, monthly volatility. In fact I can even set it up so there’s a nice payoff, more than the value of IO loan, should interest rates shoot up. The downside is known, I doubt interest rates would hit 0%, but they certainly might but they will never hit negative will they? So while I’ll end up paying more if it turns out interest rates fall to 3% and I’m still eating up the costs to hedge against 10,15 even 30% increases over the life of the loan, well there’s a situation where I’d lose but at least my downside is known and limited. It is the bank who is really getting screwed in this situation as they are burdening a great risk (the value of the loan) and I’m only paying a small monthly fee. I think we see how that played out with the sub-prime mess. In any case if we’re talking personal finance we cannot look at mortgages as a single part. We have to take into account our current cash flow, assets and projected cash flow. I’d rather place any money I have into assets that have the potential to appreciate greatly. I look at my mortgage as more or less a bond that can certainly increase in value but not at the same rate as even the most prudent and conservative value based investing. The main thing gained, philosophically, is a greater diversification of risk. I doubt my home will go from $250,000 to $500,000 over a 5-7 year period but GOOG certainly did for me (at an appreciably faster wait). Sure I would have liked to put more in GOOG and not in my house, but I cannot know after a purchase whether I could “afford it” or not. The idea is to keep as much of your money away from assets that are highly depreciating and towards assets that can make you money. If you’re using your free cash flow from IO on luxury items and other things that depreciate rapidly, you are not really taking advantage of it and opening yourself up to a lot of risk. Sure there’s a lot of people who’d rather have put money into their homes rather than other assets (such as people living in Silicon Valley 30 years ago) and probably outpaced most stock indexes by a large margin, but those people are few and far between. And as I said before, there is no way anyone could have known they were purchasing a house in Silicon Valley (ergo the house price was low to begin with). Armed with this knowledge we can say we don’t know what the best investment is, but if we diversify and carry costs to manage risk, we’re putting ourselves in a position to not hit lottery per se, but a solid system to keep funneling cash into. PS Whoever said that this is an American thing, with housing prices sky rocketing has no actual knowledge of the real estate market in the UK. They’ve sustained much higher home prices for a greater length of time. You can look at leases and IO loans and say that it is people using things they can’t “afford,” but I’d say it gives them the ability to be more free in their financial choices. If my ROI is going to be low and known to be low from the outcome, there’s no reason I shouldn’t obtain it for as cheap as possible and put my money in something with a good ROI. I have an interest only mortgage lasting another 14 yr, my mortgage is a shocking one which I pay 3.9 above Bank of England rates. I’m in debt and managing low I retest free payment but not getting debt paid off. My creditors are offering me settlements but I am wanting to apply for new mortgage in a couple if years when I’ve tried sorting my debts. Will settlements affect my chances or will I need to pay them off fully? Or will they fall off my credit record? I honestly don’t know what to do for the best and feel that I’m running out of time as interests rates will be going up and so will my mortgage. The only good thing is I’m in a better financial situation than I was. I have Â£40000 equity in my home. Do I try paying as much off my mortgage as I can while interest is low or concentrate on my debts ???? any advice would really help me and my children.